Thanks to the hard work and good ideas of our Extension Master Gardener℠ volunteers in Craven County, there’s something flowering at the Craven County Agricultural Building every month and just about every week of the year. 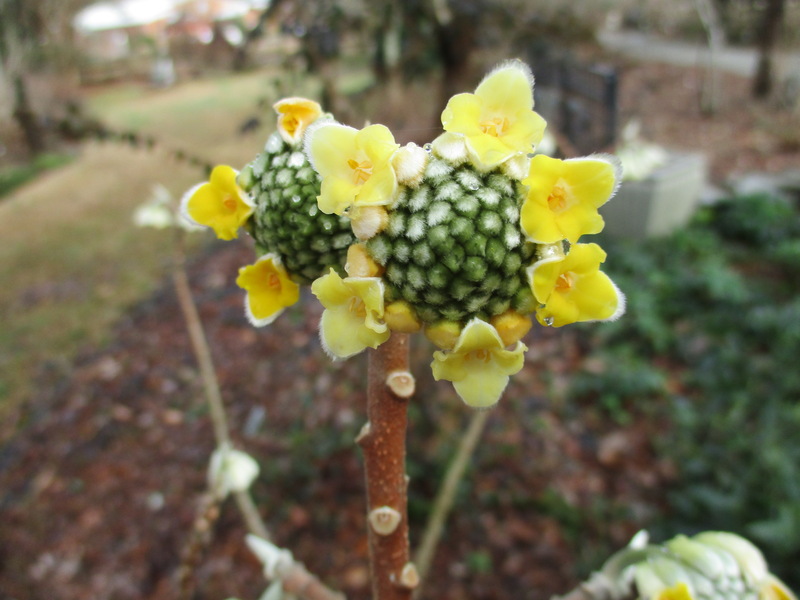 Around the third week of January, I noticed that the flowers of Edgeworthia papyrifera (paperbush) were just starting to open. In full bloom, this plant produces a nice splash of fragrant, yellow flowers grouped at the ends of reddish-brown stems. During the growing season, you’ll appreciate the dark green to nearly blue-green foliage and the open, multi-stemmed growth habit. Edgeworthia is best in light to moderate shade, in soils with lots of organic matter. Many residential properties have areas that were relatively undisturbed during development and still retain much of the original forest soil. That’s where you’d want to plant Edgeworthia – and not in the compacted subsoils around the perimeter of your house, with exposure to all-day full sun. Edgeworthia is in the thyme family, or Thymelaeaceae, which makes it a relative of winter daphne (Daphne odora). While winter daphne has a reputation for being relatively short-lived (but I’d argue still worth planting), paper bush appears to be a longer-term investment. If you have the right location, consider adding this plant to your landscape in 2019. By the way, Ethel Hess, one of the volunteers who has provided leadership on plant selection and maintenance of the grounds for many years, was recently recognized for 2,000 hours of volunteer time. Jennifer Knight and Barbara Mauer, who volunteer on other Extension Master Gardener volunteer projects, have also attained the 2,000-hour level. Many thanks to all three! Edgeworthia papyrifera flowers just getting started in mid-January.